Check out this one of a kind project by Concrete Countertop Institute alumnus Thomas Lancaster of Lancaster Concrete Designs in Alpine, TX. It makes me want to kick up my heels and go line dancing, but I think that’s the point. This project was actually inspired by Thomas’ wife. She had the idea one day while meditating and told Thomas they needed to make it happen. After a lot of planning and over a month of templating and designing, this project was ready for concrete. It was to be installed in a local restaurant, the Saddle Club, with a Western theme. The tops are made from precast concrete. 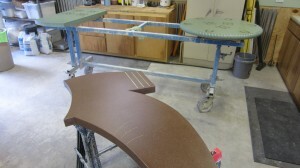 The tops of the bench and table are made from precast concrete. The base of the boot is constructed using GFRC. It features two distinct pieces held together with magnets for easy moving. Since the entire project is made in pieces, future versions can easily be shipped out to ordering customers. Creating the boot base was the most difficult part of the project. Here it is, almost complete. 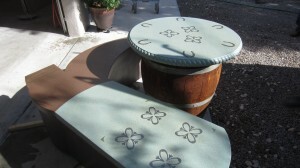 The boot top is made using precast concrete and sits on the base over rubber dowels. The idea was just a concept when this project started, but since the boot bench has been in place, it’s certainly been tested. Just last weekend the club had a long music festival with thousands of guests, and the boot held up beautifully. 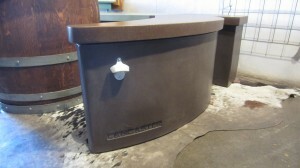 The table base is an imported wine barrel with a precast concrete top. It features a decorative rope edging and steel inlays. The turquoise color is stunning. The versatility of concrete makes it easy to incorporate unique accents and special features. Adding these custom additions can make a piece more usable and more appreciated. In this special boot bench and table set, Thomas incorporated several special features for a truly unique project. Bottle Opener on Side of the Boot- this piece is in a club/restaurant and the bottle opener certainly comes in handy. Decorative Horse Shoes in Table Top- Thomas used pony shoes as a decorative accent in the table top to complement the restaurant’s Western theme. Multi-Part Construction- With over 40 square feet of concrete, the finished piece weighs about 400 pounds, a lot for any one person to lift. To make transport easier, the boot is constructed in multiple pieces and can be easily moved. Company Branding- Anyone wanting to know who created this work of art won’t have to look far; Thomas included his name at the base of the boot for all to see. The bottle opener and company name are just two of the custom features added to this project. Beautiful work Thomas! We’re sure the Saddle Club patrons get a kick out of this unique piece. I know I’d certainly love to enjoy a good meal on a bench like that. 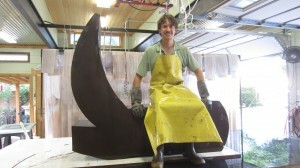 Thomas attended The Ultimate Concrete Countertop Training in March 2011. View more of Thomas’s work at www.lancasterconcretedesigns.com or www.facebook.com/LancasterConcreteDesigns.